The range of foods I can process has widened after so long in Vietnam. As a child, I had fairly typical aversions to certain vegetables, none of which have continued into my adult life. For no apparent reason that I can recall, cauliflower, green beans and brussel sprouts engendered the strongest ill-feeling. I vividly remember once lining my gums with a few remaining beans I simply could not get down, excusing myself from the table and spitting them into the toilet. Yes, I grew up in one of those households where you sat at the table until every last morsel was in you. Animal, mineral or vegetable. The vegetable dilemmas, however, were far outweighed by the animal. Here, I'm talking texture. Back then I had no concept of fat being where all the flavour is, that the meat closer to the bone was tastier, too. 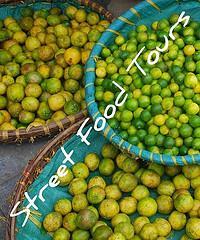 The slow cooking of meat in stews and the soft gelatinous fat that resulted was anathema to me. I had an aversion to what I called "wet meat". If my teeth were jolted by a chip of bone in my preferred meat - well-done sausages - I would have to down cutlery and calm myself for a moment before I could continue. That long spindly spike of cartilage that ran parallel to a chicken drumstick, I found unnerving. Sucking marrow out of a chop bone? Eating my father's tripe in white onion sauce? A runny egg? All of these (and more) were deep dark places for me as a boy eater. Vietnam has forced me to mature somewhat; a case in point being a bowl of noodles I ate earlier this year in Huế. Served on the footpath by a mobile vendor carrying her business across her shoulders, this bowl of funk would've sent my nine year-old self running for the hills. The initial ingredients going bowl-ward I would have had no difficulty with; sticky handfuls of fresh bun (rice vermicelli) are flung atop some leaves. When knife gets run over the chopping board, however, the protein is in play. 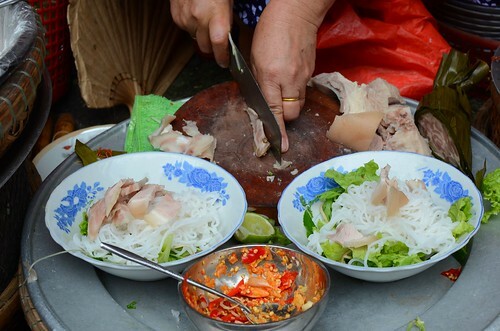 Giò thủ is a Vietnamese pork brawn cut from a banana leaf casing, comprised of the textures chewy, crunchy, gelatinous, slimy and a little bouncy. Parts of it can ricochet in the mouth. A version of this is sliced into the bowl. Added next is another kind of 'sausage', nem chua, a fermented pink number of minced pork and shredded pig skin. Various cuts of fatty boiled pork round out protein proceedings. That nine year-old self would be in a catatonic state by now. 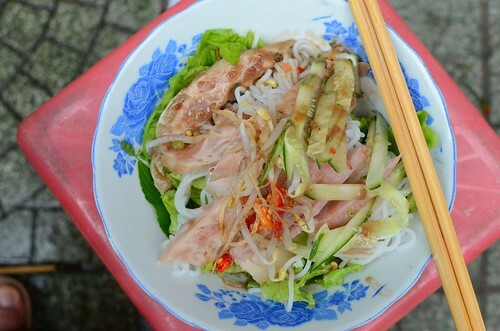 The vendor tosses on bean sprouts and cucumber in a last flourish before the flavour gets added. 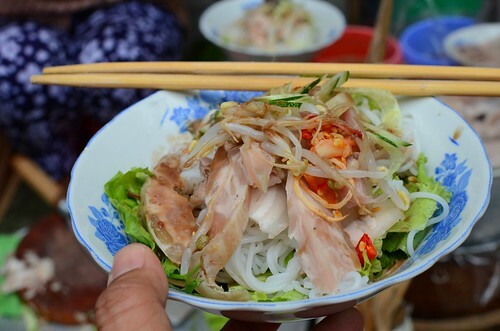 Mắm nêm is a fermented anchovy sauce usually customised by the individual vendor or home cook with ingredients ranging from pineapple and lemongrass to lime, garlic, sugar and chilli. Playing around with sauces is a sport in Vietnam. A ladle of this vendor's version is spooned over and then I take possession of my blue floral bowl. A wicked hot crush of chilli and garlic is my condiment of choice. Then it's action stations. And in the mouth, there is action aplenty. Lots for the teeth to do. Massive blows to the tastebuds. It's a war going on in there. But now I exit that war - with texture - the victor.